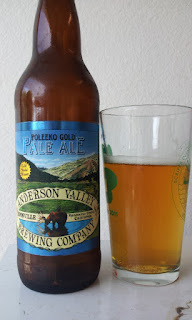 This is a surprisingly complex beer for being so simple, but it shouldn't surprise anyone given AVBC's reputation around here. Serious bitterness (though only at 28 IBU) pierces right through the maltiness, yet with minimal hop intrusion. So, really this should be proclaimed to be an English-style bitter (even though they make a separate 'ESB'), because 'pale ale' doesn't do it any justice besides an accurate description of the body and color. Despite it being so good, I still have to compare to Harpoon's single-hop ESB. No contest, sorry. Regardless, I can see why the English have a fondness for bitters: They make it easy to camp out in a pub, playing snooooker and eating boiled foods with Mrs. Featherbottom.